A few months back, a friend of mine pointed me to some YouTube clips of the TV show Portlandia, the Fred Armisen/Carrie Brownstein show satirizing the city of Portland. The show is mildly amusing. However, it appears that someone involved in the show doesn't like it when anyone satirizes them. Ryan points us to the news that blogger/writer Jenny Lawson, a fan of the show, decided to use the create-your-own-products store Zazzle to make a parody of a Portlandia skit known as Put A Bird On It!. 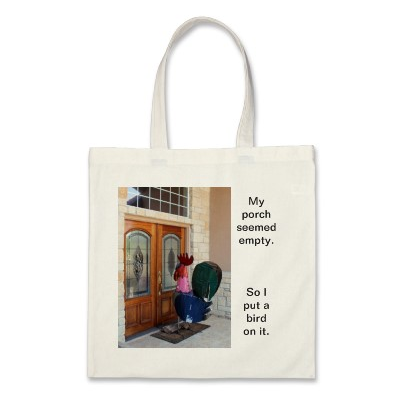 She created a tote bag, and put a dead dodo bird on it, with the phrase "Put a bird on it!" as well. She also linked to Portlandia, and figured that people would recognize that a dead dodo bird was clearly parodying the Portlandia episode. Apparently, the Portlandia people didn't get this and issued a takedown. That's not where the story ends. 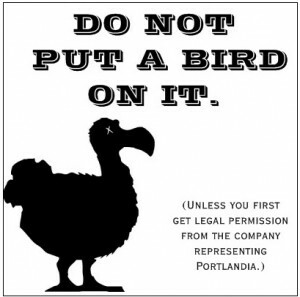 In response, Lawson decided to then mock the takedown itself, with this lovely design: With it, she included the following text: And... it took all of a day for Portlandia people to issue a takedown on that as well. This is both lame and idiotic. 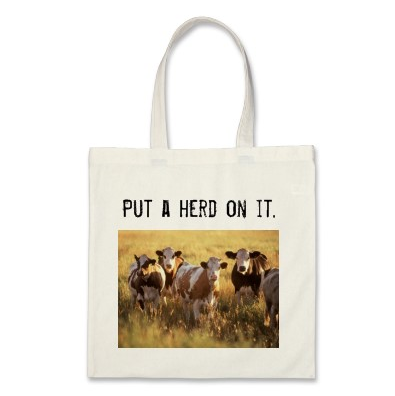 Put a herd on it, indeed. 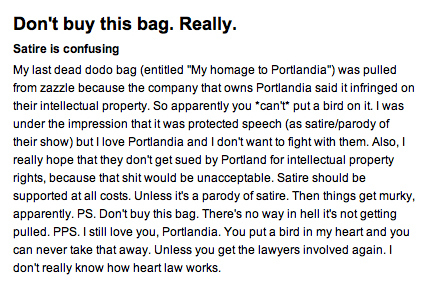 Honestly, it makes you wonder what the legal folks involved with Portlandia are thinking. I know it's made me not particularly interested in watching any more of the show. Holy crap, y�all. I just got an email from Fred Armisen (co-creater and co-star of Portlandia), telling me that he and Carrie have no clue why those bags were banned, and that they think they�re fabulous. Then he asked how they could help, and he and Carrie offered to sign some of the bags personally. Which explains exactly why I love Portlandia, social media, and birds. I considered making one saying �Carrie and Fred personally approve of the birds on this bag� (and then have them sign it, along with a notary public), but instead I just suggested that they sign one and auction it off to a charity that rescues birds from crack houses. And we�d call it The GET-A-BIRD-OUT-OF-THERE Auction. No word yet from Fred. It�s possible I may have frightened him. UPDATED: Holy crap, y�all. I just got an email from Fred Armisen (co-creater and co-star of Portlandia), telling me that he and Carrie have no clue why those bags were banned, and that they think they�re fabulous. Then he asked how they could help, and he and Carrie offered to sign some of bags personally. Which explains exactly why I love Portlandia, social media, and birds. 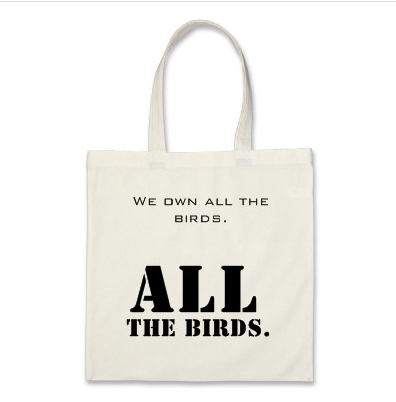 I considered making one saying �Carrie and Fred personally approve of the birds on this bag� (and then have them sign it along with a notary public), but instead I just suggested that they sign one and auction it off to a charity that rescues birds from crack houses. And we�d call it The GET-A-BIRD-OUT-OF-THERE Auction. No word yet from Fred. It�s possible I may have frightened him.